This report was launched at Parliament House Canberra on 23 August. 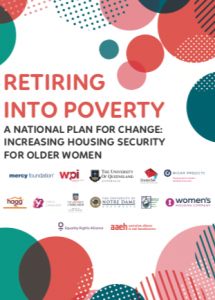 This important national document outlines the issues facing older women living in housing insecurity or homelessness and identifies needed changes to policies and programs. One of they key issues highlighted by the report was women’s lack of superannuation as a result of being out of the workforce raising children and caring for family. A few weeks after the report was launched in Canberra, Opposition Leader Bill Shorten pledged a $400 million plan to deliver top-up payments for thousands of women (or men) on parental leave. A great start to addressing this issue. Read more here.